The Hebrew term aliyah is literally translated as “ascent”. It is one of the key concepts of the Zionism movement. 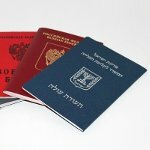 Following the establishment of the State of Israel in 1948, the right of Jews to come to Israel and to gain Israeli citizenship was enshrined in the Law of Return. For about 2,000 years, most Jews have lived in the diaspora. Large-scale immigration of Jews to Palestine began in the late 19th century, following the end of the Russian pogroms. There had been several large waves of immigration prior to the establishment of the state of Israel in 1948. In 1950, the right of Jews to come and live in Israel was enshrined in law. The original date of Aliyah Day is 10 Nisan. According to the Book of Joshua, on that day Joshua and the Israelites crossed the Jordan River into the Promised Land, after forty years of wandering in the desert. This event is considered to be the first documented “mass aliyah”. However, 10 Nisan occurs only a few days before Passover, when Israeli schools close for the spring break. Therefore, Aliyah Day is observed in schools on 7 Cheshvan. This day is also symbolic, as the weekly Torakh portion read in synagogues that week is Lech-Lecha. It tells the story of Abram (who would become Abraham) leaving for Canaan with his wife, following God’s command, which can be considered the first aliyah ever. Aliyah Day began in 2012 as a grassroots community initiative and was officially established by the Knesset in 2016.